Ayotte delivers heart-stopping action, romance, and intrigue in this brilliant sequel to the award-winning thriller, Flower of Heaven. Francoise Dupont, now Queen Farah of an oil-rich Middle Eastern country, continues the search for her sons, given up for adoption at birth. Thirty-five years later, their lives now are at risk from ruthless enemies of her husband, the King. 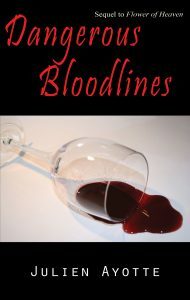 A page-turning journey from Paris to Stockholm, to the vineyards of Orvieto, Italy and to the remote hospital in war-torn Ethiopia, Dangerous Bloodlines will keep you guessing. The readers of my debut novel, Flower of Heaven, wanted more of this story and that meant a sequel. Things are almost never as they seem. The ending in Flower of Heaven begged for more to the story, and I gave them what they wanted in a way they never expected. The thrills, the characters, the locations, they all played a part in concluding the story left up in the air in the first book. The characters had partially been established in Flower of Heaven, but new vibrant ones were needed to move the story forward. My love of foreign locations made selecting a character from such locations an easy task.